"The world will little note, nor long remember, what we say here, but it can never forget what they did here." 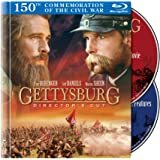 Abraham Lincoln's iconic Gettysburg Address frames this epic, feature-length HISTORY special, commemorating the 150th anniversary of the Civil War. GETTYSBURG looks at this battle from a visceral new perspective, that of the everyday soldiers who fought there, in a confrontation that changed the fate of our nation. Stripping away the romanticized veneer of past treatments, this special conveys new information and honors the sacrifice of those, both North and South, who fought and died there. Raw, immersive and emotional, this groundbreaking event puts viewers inside the three-day battle where over 50,000 men paid the ultimate price. This combo pack includes the entire action-packed special in both immersive high-definition Blu-ray as well as DVD. First and foremost, I do not get paid to write reviews. I also did not receive this product for free in exchange for a good review. I bought this thinking it was another movie on Gettysburg, but it wasn’t. It’s actually a DVD special from a History Channel show that I had seen on TV before. The show is OK, but I didn’t feel like it’s worth $7 to spbe nd my money on considering it was only an hour show. I would rather purchased a movie instead. Graphics were subpar as well as the dramatic schenes. If anything, it felt like a low budget movie that was actually a TV documentary. I wouldn’t purchase again if I had to do it over again. This is very much a mixed bag. On the one hand, the production captures the gritty brutality of hand-to-hand Civil War combat well. It’s bloody, intense, and in parts uncompromising. It looks very much as if it was directed by Michael Bay, which may or may not float your boat, depending upon your tastes. On the other hand, wherever this show was filmed, it looks very little like Gettysburg. It is understandable that they couldn’t film on location there, due to the sheer number of monuments and markers, but the sequence featuring the railroad cut in day one looks more like it was shot outside Los Angeles than in Pennsylvania. The CGI varies from okay to downright poor, although to be fair this is a made-for-TV docudrama. I just expected more from Ridley Scott, I guess. Pick it up if it’s cheap. 5.0 out of 5 starsGood documentary. Def worth the purchase. I purchased this DVD many yeas ago. I thought it was a very good documentary. Still enjoy it today. The approach of the film was to take in different perspectives/personal views and etc while still giving a historic and knowledgeable approach,. -Saw complaints about blood.. yeah its called war and take it how you want, some DOCUs wont have any, some too much.. i liked the more realistic approach. -You can decide to watch a boring film, as with a history prof rambling on, or take a different approach like this film and enjoy it. In all, at its price its def worth every penny. An excellent depiction of the Battle of Gettysburg. Follows and discusses the human qualities of a number of soldiers involved - it makes you realize that these were people just like us and the sides were more similar than they were different. Additionally, they make military strategy easy to understand and do a great job explaining what happened and why. Everyone should own at least 2 copies of this. I love this documentary. 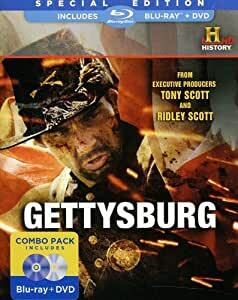 Probably one of, if not THE best documentary on the Civil War. Gripping, intense, brutal, and realistic, it shows a different perspective about the Battle of Gettysburg done in a more modern, realistic "Saving Private Ryan" style which educates as well as entertains. It is from the Ridley Scott team, so of course it has a slightly more dark violent style to it that adds to the intensity. The interviews, photos and new computer graphics bring a new refreshing take to a story that's been done to death before, but puts it in a new light. The HISTORY CHANNEL did a great, amazing job with this. Well worth the money and highly recommended. 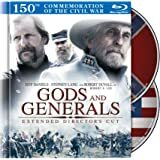 An absolute must for any true Civil War buff.